I’m Bojan Sandic, a 24 year old professional logo and branding designer from the beautiful country of Bosnia and Herzegovina. I am also the head of Skydesigner, a fantastic 5-man team—four designers and a customer support staff—a local design studio located in Laktsasi, Bosnia. Currently, I’m in my fourth year of university, in the Faculty of Information and Graphic Design, UPS Banja Luka. So, at the moment, I juggle education and business, which is not all that easy, as Fiverr feels like a full-time job at the moment. I have always been fascinated by geometry, concentric lines, vectors, and all the intricate details that go into building the perfect design. So when I got the chance to finally dabble in the field I grabbed my chance with both hands. I was 17 when I finally decided to grow my fascination for graphic designing into a profession to pursue. This was in 2011, when I began to take online Adobe Illustrator tutorials on YouTube in the bid to hone my skills, and hopefully begin to make a living doing what I loved and enjoyed. In 2013, I got my professional start working at 99Designs, where I finally started to work on projects independently, and broaden my scope. While working here, I won numerous design and logo contests, which I must admit, was a great motivator; encouraging me to work even harder. When Did Your Fiverr Journey Begin? While I had a faint idea of what online freelancing was at the time, I never really considered it an avenue to make a real income. For starters, the basic set-up of Fiverr was a little disconcerting—5 dollars for a logo design? Nah, I’ll pass. Anyway, after doing some research, and learning how others had begun earning a sizeable income on Fiverr, I decided to give the platform a try in 2014. And the rest is history. Slowly but steadily, the reviews and positive feedback trickled in, and by implication, I began to draw in (no pun intended) bigger clients and higher paying projects. Nowadays, when I think of all those nights I spent up trying to earn a five dollars, I can only smile. Since I turned pro in 2011, I, along with my team, have been able to complete over 17,500 projects; the bulk of them being logo designs, business card design, letterhead designs and vectorizations. Fiverr provides 90% of our projects, with clients from all over the globe reaching out with various tasks, form the straightforward logo designs, to the more brain-wracking complex tasks. All in all, there is really no shortage of work, we are constantly on a new exciting project, looking to cook up some magic for our paying clients. My marketing strategy is predictably digital. I market my services on Instagram, and on my Tumblr blog, reaching out to prospective clients and fellow professionals. While I originally started out as a solo designer, over time, as the projects began to mount, I decided to leverage the creative and positive energy of a team that shared my enthusiasm and dedication to perfection. SkyDesigner is a team of five I created, to fully maximize the individual potential of every member. We are four designers, with varying areas of expertise and specialization, and a customer support member to liaison with customers. With University also eating into my schedule, having a team I can rely on has been a godsend, giving me the breathing space to be the very best graphic designer and student I can be. I have barely scratched the surface of the opportunities Fiverr offers. 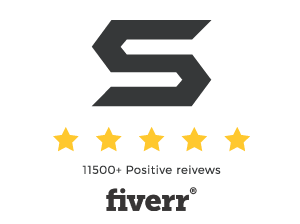 Despite the success that I have enjoyed on Fiverr, with over 17,000 completed projects, and an all-time Five-Star rating, I still strive for more. My dream, which I work towards every day, is to have 30,000 completed projects, and hitting $1 million in total revenue on Fiverr by 2021, all while maintain a perfect rating. So, in a manner of speaking, the struggle continues—I have to continue approaching this goal, one project at a time. While many in the field may recommend using templates when handling similar projects. And while this is not bad advice, in the end you must remember that all projects are unique, and should be treated like brand new babies, not a legion of twins, triplets (and whatever a group of fifty identical children is called). Getting a great brief from the client is a big bonus, as it makes their dream clear and straightforward—then you build on this. Sometimes you may run into clients that have a clear map of what they want, but the majority of the time you have to create from vague and obscure briefs. Another underrated aspect in the business of designing a perfect logo is the need for a fantastic team to bounce ideas off. With a perfect team, you can brainstorm ideas, solve problems, and have multiple perspectives to a singular job. So I would say, a great brief (when available), and a team that perfectly complements your skills is the recipe to coking up the perfect logo design. I would love to give something back to the community that has contributed to making me the person I have become today. I am working towards opening a learning facility in Banja Luka, fully equipped to help budding and up-and-coming graphic designers and freelancers succeed in their chosen fields, as early as 2022. I hope I will be able to inspire new designers by sharing my experience—challenges, strategies, and most importantly, success story—to help motivate newcomers to keep at it. Freelancing has been a deeply rewarding experience, all the way from the very first project: knowing you are able to provide a solution to a client probably from the opposite side of the globe. Fiverr has given me an avenue to market my skills to a global audience, and the concept of online freelancing is one every graphic designer should seriously consider.